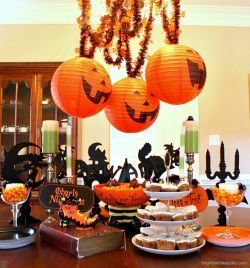 Halloween appetizers are fun ways to spook up your party and preparation may not be as scary as you think. 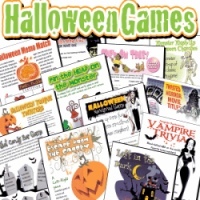 You can stir up a lot of attention when snake bites, vegetables, and cheeseballs all show up in full costume. While looks are important, your guests will expect a delicious taste as well. Any get-together will be better with appetizers all dressed up and ready to glow. 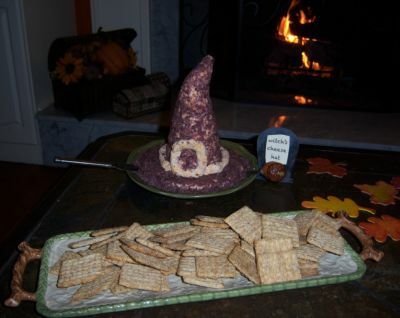 If you are a first time food haunter, make it easy on yourself with a familiar recipe. 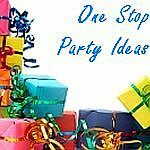 Simply make whatever your guests love or expect and take the presentation to the extreme. How thrilling. 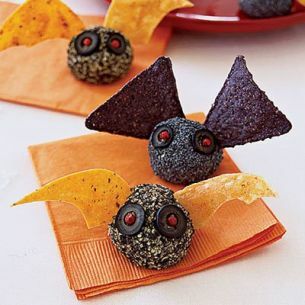 These Halloween appetizers only look tricky. 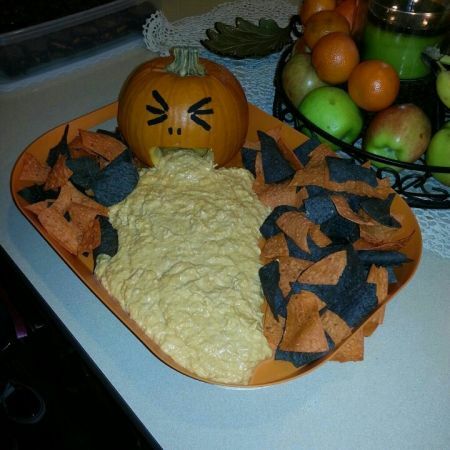 With a little imagination, you can dress up your favorite dips for the happiest Halloween ever. And best of all, the trickery was accomplished without sacrificing taste. Mix 1 can of refried beans with 1 pkg. of taco seasoning. Spread onto the bottom of dish. Add a layer of sour cream followed by a layer of salsa. Cut flat white American cheese into thin strips to make web. 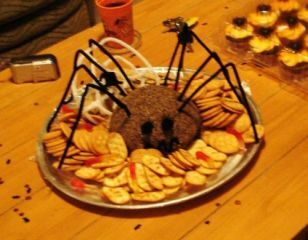 For the spiders, cut a black olive in half. Use one half for body, the other half cut into thin strips for legs. If using canned chicken, drain, and then shred chicken in a bowl and mix hot sauce into chicken well. Combine softened cream cheese and dressing, and mix until smooth. Combine chicken mixture, cream cheese mixture and 1 1/2 cups cheese in a bowl and stir well. Pour into 9 x 13 inch baking dish and bake 15 minutes on 350 degrees. Eat with tortilla chips. A new twist on an old favorite. 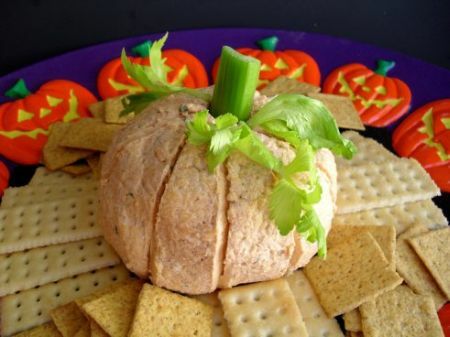 Cheeseballs are Halloween appetizers that are quick and easy, and can be made ahead. 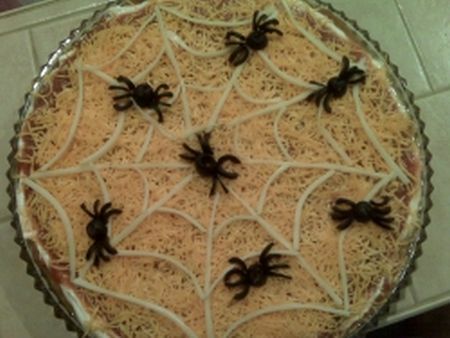 Have fun haunting your favorite cheeseball recipe. Ever get the feeling that someone is watching you. 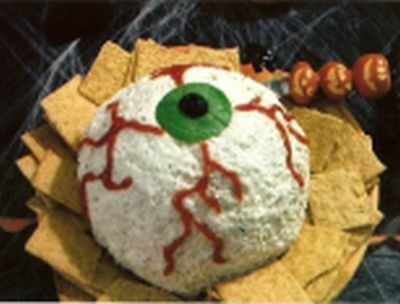 The eyes have it with this scary Halloween cheeseball. Mix all ingredients and form into an eyeball shape. In the center of eyeball, place a circle cut from a spinach leaf to represent the pupil of the eye. Half a black olive and place into spinach circle. To complete eyeball, draw on the veins using gel icing. This is one of the fastest cheeseball presentations to make, but the attention it gets will last a long time. Your guests will go batty over these bite sized mini cheeseballs and you will be surprised at how fast they fly off the table. It would not be Halloween without a witch's hat. This one happens to be delicious and extremely creative. 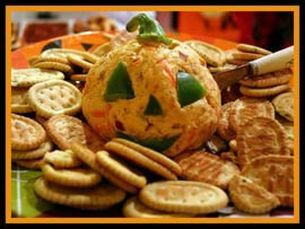 We all know that the original jack-o-lantern was a turnip, but did you know that a green pepper can turn cheeseballs into pumpkin Halloween appetizers. 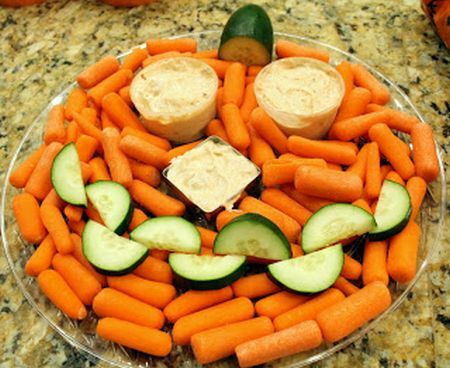 Pumpkins are the symbol of the season, so add Halloween appetizers in shapes to your party menu. Prepare your favorite cheese ball recipe. 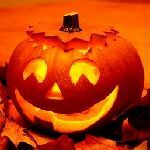 Add orange food coloring and form into a pumpkin. 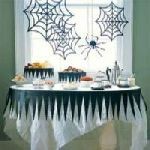 Using a blunt knife, draw lines from top to bottom to form pumpkin ridges. Cut a piece of celery for the stalk. Add leaves to complete. 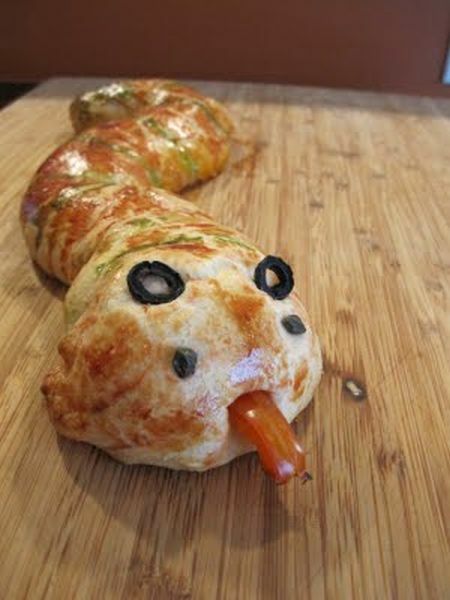 This slithering snake is so realistic that you will expect him to hiss. 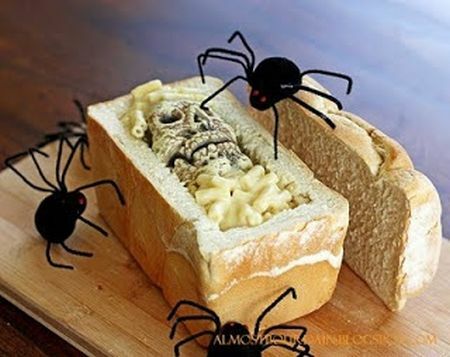 New Halloween party appetizers are great, but some favorites never die. into your holiday favorites list. Dust a flat surface lightly with flour. Spread out the crescent dough - do not separate. Pinch together the seams so that you have 1 piece of dough. Roll out to make a large rectangle. Make sure the dough is not stuck to the surface at all. Beat the 2 remaining egg yolks together. Transfer to 3 separate small bowls. Add some food coloring to each bowl - whatever colors you like! Using a clean paintbrush, "paint" the snake with the egg yolk/food coloring mixture. Don't forget to spook your vegetables. 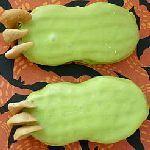 When a vegetable is orange to begin with, it makes creating pumpkin Halloween appetizers simple and easy. There is no carving required. 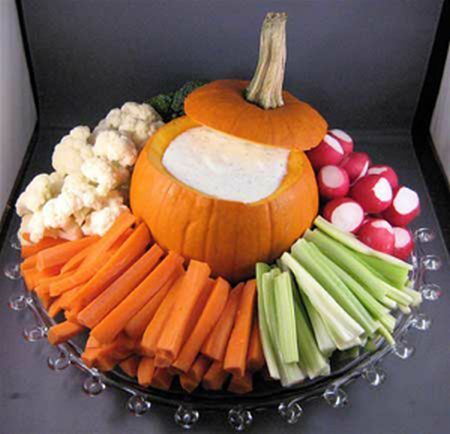 Serve the dip in a hollowed out pumpkin surrounded by vegetables.